As someone who found a 2cm lump 11 months after a mammogram, I dread to think what would have been my outcome if I waited for my next mammogram. The app provides a great How-to via videos, a push reminder(I selected every 2 weeks on a Monday and have already had my first Push Notification) but the best is the ability to record your results. When I met the doctor who diagnosed my cancer I knew the exact date of my last mammogram but could not remember my last Self Exam, a scary moment. Now I will always know. 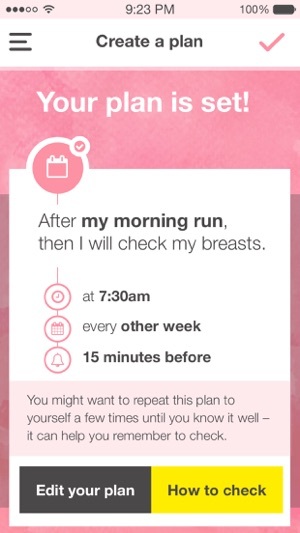 This app is a great way to encourage regular checks to our breasts for any unusual changes. If you're like me (a little forgetful!) then the Breast Check Now app allows you to set a reminder to check your breasts at whichever time or the day suits you and whether you want to check weekly, fortnightly, monthly etc. The video included was very informative and the app is very easy to use. Anything that makes life easier is okay by me!